Fantastic Results at the West Districts Championships! Over the last two days, several of our athletes took part in the 2017 West District Championships. 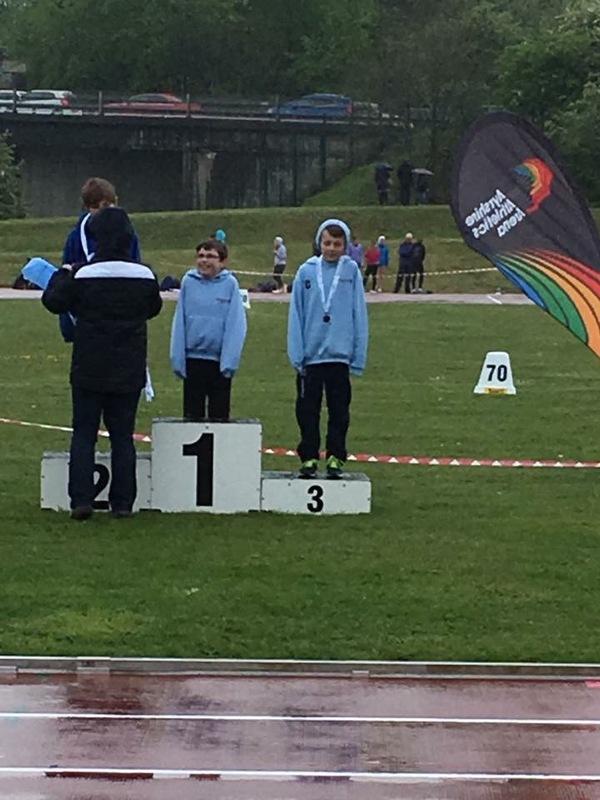 Despite the heavy rain and cold, there were lots of great performances, with no fewer than 18 medals winging their way back to Cumbernauld! Emma kicked off Friday night with the u15G 200m, with a time of 30.14 in the heats. Well done Emma! Callum and Adam then followed in the u13B 200m, with Adam earning a place in the final. Adam then came 5th in the final with a new PB. Well done to both boys! Next up was the u15B 1500m, with Calum running in the heat (4:41.52) and earning a place in the final. In the final, Calum ran a fantastic race and won a BRONZE medal! Well done Calum! Also running well in the u20W 1500m was Alicia, who had a strong run to finish 4th with a new outdoor PB of 5:22.64. Well done Alicia! Meanwhile, the field events kicked off with the u15G Triple Jump. An amazing performance from Aimie won her a GOLD medal, as well as setting a new Championship record with a jump of 9.88m! Well done Aimie! Hannah also jumped well with a best jump of 9.65m earning her a SILVER medal! Well done Hannah! Later in the evening it was Thomas’s turn to jump in the u17M Triple Jump, where a huge PB of 11.91m won him a BRONZE medal! Well done Thomas! Next up was Stella, throwing in the u15G hammer. A fantastic throw of 36.82m earned Stella a SILVER medal! Well done Stella! Amy and Stella competed in the u15G discus which didn’t finish until after 10.00! Amy threw a distance of 19.68 which got her into the final and Stella threw a distance of 17.32 which was a great PB! Well done to both girls! Then Callum topped off the night in the u13B discus, throwing a PB of 13.30m, earning him a BRONZE medal! Well done Callum! Sophie kicked off a very wet Saturday morning with a great run in the 400m Hurdles. A big PB of 73.71 earned Sophie a BRONZE medal! Well done Sophie! Alasdair ran first in the u15B 800m heats in a time of 2:15.95, which qualified him for the final a few hours later. In the final, Alasdair ran a strong race in a time of 2:08.93 which earned him a SILVER medal. Well done Alasdair! Lucy and Victoria then ran in the u20W 800m which was a straight final. Lucy ran a great time of 2:19.27 to win a SILVER medal! Well done Lucy! And Victoria came 5th in the final with a great time of 2:38.67. Well done Victoria! Finally, Craig ran in the timed finals of the u13B 800m, where he came 6th with a huge PB of 2:30.35. Well done Craig! Melissa was up first in the u13G 100m heats, where she ran a PB of 14.76 which earned her a place in the semi-final where she ran a time of 15.42. Well done Melissa! Adam and Ethan were up next in the u13B 100m heats, where they both qualified for the semi-finals with times of 14.06 and 14.46 respectively. In the semi-final, they ran times of 14.63 and 15.72, earning Adam a place in the final where he came 5th with another PB. Well done to both boys! 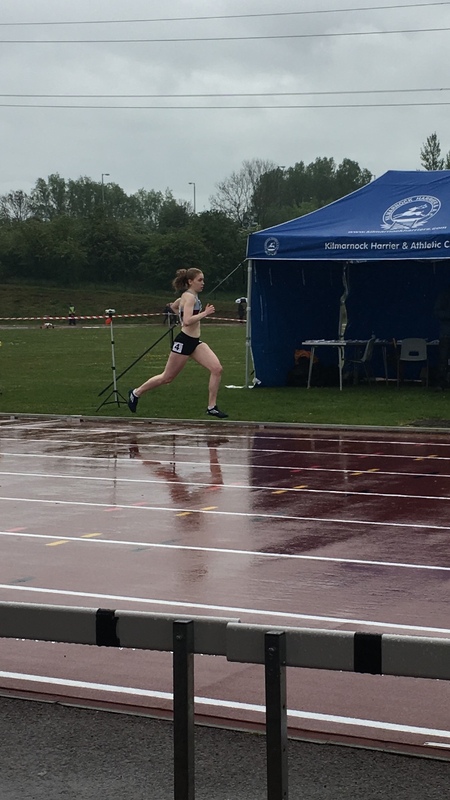 Emma also ran in the U15G 100m, where she ran a time of 14.93, well done Emma! Finally Beth was also running in the U20W 100m. She ran well in the heats with a time of 13.09 to qualify for the final, where she just missed out on a medal coming 4th with a time of 13.05. Well done Beth! Beth and Jamie both ran in the 100m hurdles where they both picked up fantastic BRONZE medals with times of 16.27 and 16.40 respectively. Well done to both the Tobins! Next on the track were the 75m hurdles races. Amy and Hannah both started off in the u15G heats with Amy running 13.02 and Hannah running 13.16, earning them both places in the final. In the final Amy came 5th with a time of 13.19 and Hannah was 8th with a time of 13.39. Well done to both girls! Euan and Ethan then ran in the u15B hurdles which was a straight final, where Euan won a GOLD medal and Ethan won a BRONZE medal with times of 13.87 and 14.02 respectively. Well done to both boys! Lewis then ran in the 400m heats, easily qualifying for the final, where he won a GOLD medal in a time of 49.29. Well done Lewis! Calum then ran in the 300m where he came 6th with a time of 43.10. Well done Calum! Meanwhile, there were lots of field events going on, kicking off with the u13G long jump and Melissa. Melissa came 9th overall with a PB of 3.68m! Well done Melissa! Next up were Craig and Euan in the u13B long jump, where Euan came 4th with a best jump of 4.12m, and Craig was 6th with a best jump of 4.10m. Well done boys! 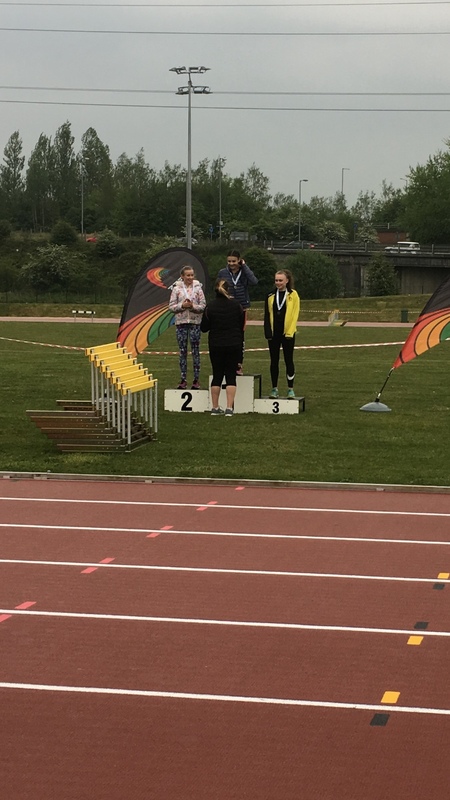 Finally, it was the turn of Hannah and Aimie in the u15G long jump, where Hannah won a BRONZE medal with a best jump of 4.83m, and Aimie came 4th with a best jump of 4.52m. Well done to both girls! Paul started off the day with a huge PB of 8.95m in the u15B Shot Put, which led to him finishing in 4th position overall. Well done Paul! Later, Amy came 5th in the U15G Shot Put with a best throw of 8.89m, well done Amy! 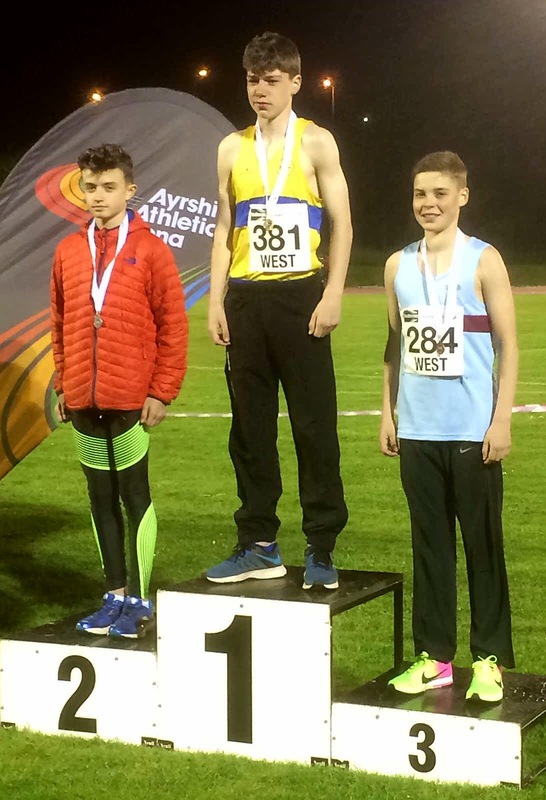 The Atkinson brothers led the way in the javelin, with Paul finishing 4th in the u15B javelin with a throw of 26.23, and then Adam winning a SILVER medal in the u13B javelin with a throw of 21.62. Well done boys! First up were Jamie and Arran in the U17M High Jump. Jamie jumped a height of 1.79m to win a GOLD medal, and Arran jumped a PB of 1.59m to finish in 5th place. Well done to both boys! Later, Ethan jumped 1.11 in the U13B High Jump to finish in 5th place. Well done Ethan! Last but not least Arran took part in the U17M discus, where he won a GOLD medal with a throw of 22.65m. Well done Arran! A fantastic set of results from a great team of athletes! Well done to everyone involved!